Compositions and methods for promoting mesenchymal stem cell expansion while maintaining a pluripotent phenotype are disclosed. Serum-free cell culture systems and kits and methods of use for mesenchymal stem cell expansion are provided. Methods also comprise the use of the expanded mesenchymal stem cells to treat various disorders or diseases, particularly those of the cardiovascular system, bone, or cartilage. FIELD OF THE INVENTION The present invention relates to serum- free cell culture systems that provide for mesenchymal stem cell expansion while maintaining a pluripotent phenotype, and methods of use for the expanded mesenchymal stem cell populations. MSCs, serum-free media and culture systems have great utility in the field of cellular therapy. The creation of highly defined environments for cell expansion is of great importance for quality purposes, and serum levels are typically very ill-defined (see, e.g., U.S. Patent No. 5,908,782). In addition, there is a risk of Bovine Spongiform Encephalopathy (BSE) contamination in patients receiving cells cultured in the presence of serum. Such a risk raises the possibility that the FDA will not allow therapies involving cells cultured in the presence of animal sera. For the aforementioned reasons, the development of new serum- free cell culture systems for the expansion of MSCs is therefore desirable. SUMMARY OF THE INVENTION Compositions and methods for promoting mesenchymal stem cell (MSC) expansion while maintaining a pluripotent phenotype are provided. The compositions include serum-free cell culture systems for MSC expansion that comprise a serum- free cell culture medium and a two-dimensional or three-dimensional cell culture surface. In the serum- free cell culture system of the present invention, at least one insoluble substrate protein is presented from the cell culture surface. In one embodiment, the cell culture surface comprises a cell culture support bound to a cell adhesion resistant (CAR) material, which in turn is bound to at least one insoluble substrate protein. Insoluble substrate proteins for use in the present invention include extracellular matrix (ECM) proteins such as fibronectin, laminin, hyaluronic acid (HA), vitronectin, collagen proteins such as collagen I, collagen II, collagen III, collagen TV, collagen V, and collagen VI, or any combination thereof. In one embodiment, the cell culture surface comprises a cell culture support bound to a cell adhesion resistant (CAR) material, which in turn is bound to at least one insoluble substrate protein, for example, at least one ECM protein. The serum-free cell culture medium is a solution that comprises a mixture of soluble MSC growth-promoting factors. Compositions further include kits comprising serum-free cell culture media and a two-dimensional or three-dimensional cell culture surface suitable for MSC expansion. Methods of the present invention comprise the use of these serum-free cell culture systems to promote the expansion of MSCs. Further methods comprise the use of these serum- free cell culture systems and expanded MSCs for cell transplantation or to engineer tissues to treat various disorders or diseases, including those of the cardiovascular system, muscle, ligament, bone, tendon, cartilage, nervous system, blood, immune system, liver, or pancreas. Further methods comprise the use of these serum-free cell culture systems to promote the expansion of MSCs within primary aspirates from whole bone marrow such that the MSCs are co-cultured with non-MSCs present in the primary aspirates. EDC activates the -COO" groups present in HA, creating a reactive ester intermediate (ester (o-acylisourea) intermediate). This intermediate is highly unstable and subject to hydrolysis, leading to the cleaving off of the activated ester intermediate, forming an isourea, and regenerating the -COO" group. To stabilize this reactive ester intermediate, and increase reaction yield, a molecule able to enhance the reaction promoted by EDC should also be present. Such stabilizing compounds are generally selected from the class of N-hydroxysuccinimides and aryl or heterocyclic derivatives thereof. Preferred N-hydroxysuccinimides include, but are not limited to, N-hydroxy- succinimide (NHS), hydroxy-sulfosuccinimide (sulfo-NHS) or hydroxybenzotriazole hydrate. Although not intended to be bound to a particular theory, it is believed that attachment of HA to the amine containing polymer surface occurs through a mechanism wherein (for example) EDC and NHS combine to create an active ester polysaccharide with a carboxyl group capable of coupling to an amine. When coupling occurs, NHS is released. Other compounds known in the art that are able to react with EDC in this manner and which serve as reactive intermediate ester stabilizing compounds should also be effective in the invention. HA covalently bonded to plasma-treated polystyrene in this way prevents attachment of any of a number of types of cells, including NLH3T3 and osteoblast MC3T3 cells as well as MSCs and a variety of primary and stem cells. Suitable derivatives of HA that may be used in the invention will be known to the skilled artisan, and are described, for example, in U.S. Patent No. 4,851,521. These include partial esters of HA with alcohols of the aliphatic, araliphatic, cycloaliphatic and heterocyclic series,and salts of such partial esters with inorganic or organic bases. Similar derivatives of alginic acid should also be useful. Further, other plasma treatment methods for producing surfaces with amine and other nitrogen-containing groups are also suitable, and are known to those of skill in the art. The cell culture surfaces for use in the serum- free cell culture systems include but are not limited to standard tissue culture vessels and two-dimensional surfaces, including sheets, slides, culture dishes, culture flasks, bags, culture bottles, or multiwell dishes. Alternatively, three-dimensional cell culture surfaces, such as microcamers or three dimensional (3-D) scaffolds, including but not limited to foams, hydrogels, or fiber meshes may be used for generating a three-dimensional cell culture, tissue, or organ. "Three-dimensional scaffold" refers herein to a 3-D porous template that provides a very high surface area to volume ratio for cell culture. These scaffolds may be used for initial cell attachment and expansion, or subsequently for tissue formation either in vitro or in vivo. A 3-D scaffold according to this invention comprises base materials (described below), a CAR layer and bound thereto one or more insoluble substrate proteins, such as the ECMs disclosed herein, and, optionally, other substances, which promote or enhance cell attachment, growth, migration, and/or differentiation. In one embodiment, the scaffold is seeded with MSCs and contacted with the serum-free cell culture medium described herein below in order to permit cell growth and differentiation in a structural environment that more closely mimics the in vivo setting. Cells derived therefrom can be isolated from the scaffold or can be implanted with or without the scaffold into a suitable location in the body of a mammal, preferably a human patient. However, the use of this technology could easily be translated to non-human mammals such as cats, dogs, horses, and the like. The shape and dimensions of the 3-D scaffold are determined based on the organ being replaced or supplemented, and the type of scaffold material being used to create the construct. For example, if a polymeric scaffold is used for heart tissue replacement or supplementation, the dimension of the polymeric scaffold can vary in terms of width and length of the polymeric scaffold. One of skill in the art recognizes that the size and dimensions of the polymeric scaffold will be determined based on the area of the organ being replaced or supplemented. Furthermore, other suitable articles may constitute a cell culture support surface of the present invention, including medical devices, extracorporeal devices and artificial joints, tubes, sutures, stents, orthopedic devices, vascular grafts, membranes, films, biosensors, or microparticles. One embodiment includes a method of forming tissue-engineered constructs using a 3-D scaffold material or other suitable article that comprises the CAR surface onto which one or more insoluble substrate proteins, for example, the ECMs disclosed herein, are attached, either covalently or non-covalently. Such a scaffold in combination with the serum-free cell culture medium disclosed herein supports the maturation, development and differentiation, of additional cultured MSCs in vitro to form components of adult tissues analogous to their in vivo counterparts. The tissue-engineered constructs, in one embodiment, are created using scaffold materials disclosed herein as the substrate onto which cells are deposited and cultured in the presence of the serum- free cell culture medium described herein below, and on which cells are grown and adhere. The scaffold allows optimum cell- cell interactions, thereby allowing a more natural formation of cellular phenotypes and a tissue microenvironment. The scaffold also allows MSCs to continue to grow actively, proliferate, and differentiate to produce a tissue-engineered construct that is also capable of supporting the growth, proliferation, and differentiation of additional cultured cell populations, if needed. In one embodiment, the scaffold is biocompatible and conducive to cell attachment and subsequent tissue growth. Other surface properties can be modified to suit the intended application without altering other properties of the scaffold such as its mechanical strength or thermal properties. Useful surface modifications could include, for example, changes in chemical group functionality, surface charge, hydrophobicity, hydrophilicity, and wettability. The CAR surface technology can easily be translated to the surfaces of 3-D scaffolds. Such surface modifications are well known in the art. I I, and WNT- 16. In one embodiment, the WNT protein is WNT-3a. The expanded MSCs of the invention can also be used for gene therapy in patients in need thereof. In some embodiments, more mature lineage-committed cells will be useful, especially where transient gene expression is needed or where gene transduction is facilitated by the maturation and division of the cells. For example, some retroviral vectors require that the cell be cycling for the gene to be integrated. Methods for transducing stem and progenitor cells to deliver new and therapeutic genes are known in the art. Another aspect of the invention is a kit useful for promoting the attachment, survival, and or proliferation of MSCs, comprising a serum- free cell culture system of the invention is provided. Such a kit comprises a serum-free cell culture medium and a cell culture surface described herein, and can comprise one or more other components or reagents suitable for culturing the cell. 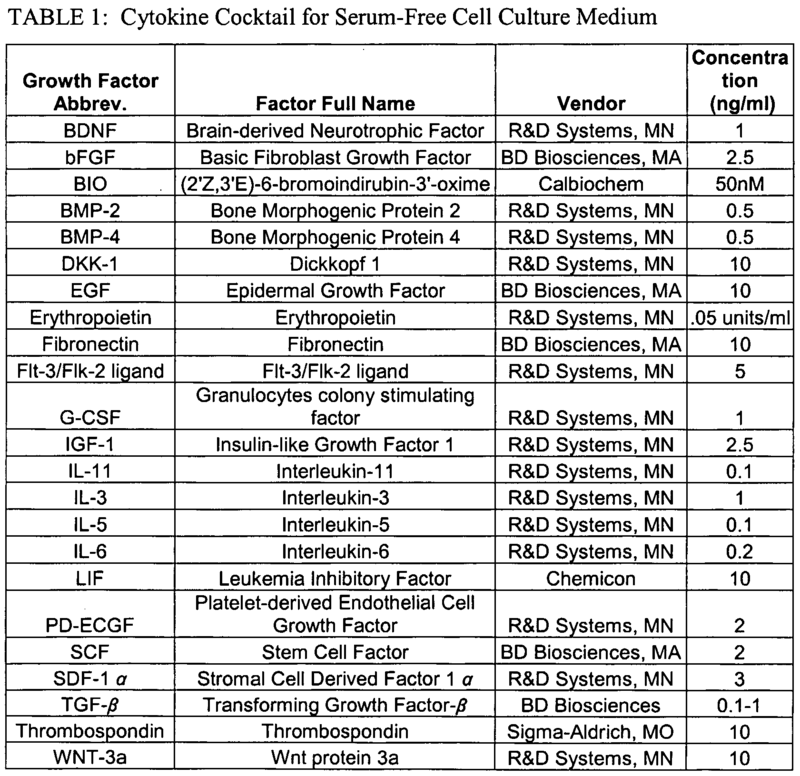 In one embodiment, the serum- free cell culture medium comprises any of the cytokine cocktails described herein, for example, the cocktail shown in Table 1 below, and a base medium, for example, the base medium shown in Table 2 below, and a cell culture surface comprising a cell culture support bound to a CAR, which in turn is bound to an ECM protein. In some embodiments, the ECM is a mixture of collagen I and fibronectin. In other embodiments, the kits comprise these components and also comprise one or more reagents for measuring cell proliferation in the culture. Such kits have many uses, which will be evident to one of skill in the art. For example, they can be used to propagate MSCs to be used in methods of cell therapy. Such kits could be of commercial use, e.g., in high-throughput drug studies. The following examples are offered by way of illustration and not by way of limitation. 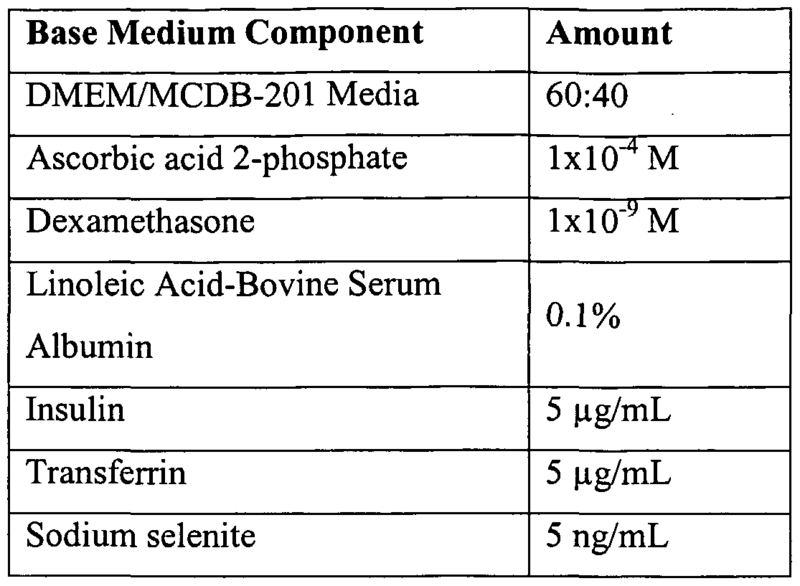 EXPERIMENTAL For these examples, the concentrations of various cytokines in the culture media are described in Table 1 , while the base medium composition is described in Table 2. Example 1 : MSC Expansion in Various Serum-Free Media MSCs along with complete growth medium were purchased from Cambrex Biosciences (Baltimore, MD). Frozen cells were thawed and cultured following manufacturer's instruction. After reaching -90% confluency, MSCs were washed once with PBS, removed from the culture surface using Trypsin/EDTA and replated at a density of 1600 cells/well (for 96 well plates) or at a density of 50,000 cells/well (for 6-well plates) which corresponds to the manufacturers recommended seeding density of 5000 cells/cm2. At day 6 or 7, cells were washed once with PBS, fixed using 4% paraformaldehyde for 15 minutes and then stained using DAPI according to manufacturer's suggestions (Molecular Probes, Eugene, Oregon). For 96-well plate experiments, one image per well was taken at 4X magnification using Molecular Devices' Discovery-1 high content screening system. Cell nuclei enumeration was determined using Metamorph Image Analysis Software (Molecular Devices, Sunnyvale, CA). The number of DAPI stained cell nuclei corresponds directly with the total number of cells per well. For 6-well plates, cell enumeration was determined using Trypan Blue exclusion and manual counting using a hemocytometer. Multiple donors (different preps of MSCs) were tested in serum-free conditions while the cells were also cultured on tissue culture polystyrene (TCPS) plates using the manufacturer's standard serum-containing medium as the control. Several serum-free expansion conditions were scaled up into the 6-well plate format (-10 cm2) and cultured for 7 days. Cells were then washed with PBS and then removed from the 6-well plates using Trypsin EDTA. Cells were then reseeded into 96-well plates at two different densities according to manufacturer's specifications. MSCs induced to form adipocytes were seeded at 7000 cells/well and cultured in Stem Cell Technologies (Vancouver, B.C., Canada) adipogenic medium supplement. MSCs induced to form osteoblasts were seeded at 1000 cells/well using Cambrex Biosciences (Baltimore, MD) osteogenic media supplements. Two to three weeks after induction, cells were washed once with PBS and fixed using 4% paraformaldehyde. Fixed cells were then stained with Oil Red O (Sigma- Aldrich (St. Louis, MO)) for adipocytes and BCIP/NBT (Sigma- Aldrich (St. Louis, MO)) for alkaline phosphatase/osteoblasts. Bright field images at multiple sites per well were taken of stained cells at 10X magnification. Percentage of differentiation was determined using Metamorph Image Analysis Software (Molecular Devices, Sunnyvale, CA) to calculate total stained area by threshold image analysis. Initial experiments compared serum- free medium expansion of MSCs in G2 medium on Collagen I (Col 1 , Sigma- Aldrich)/Fibronectin (FN, BD Biosciences) cell adhesion resistant (CAR) surface modified 96-well plates. MSCs were expanded for 7 days in G2 serum-free medium on the CAR surface and cell nuclei counts were compared to MSCs expanded in the manufacturer's recommended serum-containing medium on tissue culture polystyrene (TCPS) 96-well plates. MSCs expanded in the G2-CAR surface serum free environment were comparable to the manufacturer's recommended serum-containing expansion conditions up to 7 days (see Figure 1). Example 2: Differentiation Capacity and Surface Marker Characterization of G2 Expanded MSCs MSCs expanded in serum-free media of the present invention on CAR Col 1/FN surface for 7 days remained multipotent. Briefly, MSCs expanded in culture environments of the present invention were removed from the serum-free media and then cultured in either adipogenic (fat) or osteogenic (bone) induction media (per manufacturer's suggestions). MSCs expanded in the serum-free environments of the present invention were able to differentiate towards both adipogenic (see Figure 2) and osteogenic (see Figure 3) lineages. These results demonstrate that the serum-free environments of the present invention help to maintain stem cell pluripotency in expanded MSCs at least as well as the industry standard serum-containing media (Cambrex). This demonstrates that these cells are not committed towards specific lineages, and that therefore these MSCs may still be used for a variety or research or clinical applications. MSCs cultured in serum-free environments for 7 days retain cell surface markers showing equivalency to Cambrex cell populations expanded in serum- containing media. In addition, MSCs cultured in serum-free environments lacked CD45 marker expression, indicating that these cells do not differentiate towards hematopoietic lineages. Example 3: Comparison of Media and Cell Culture Surface Conditions MSCs cultured in three different media (G2, base medium without G2 growth factors/cytokines, and in serum-containing complete medium) all expand better on a Col 1/FN CAR surface as compared to TCPS surfaces (see Figure 4). Also, MSCs cultured in G2 serum-free medium expand to equivalent levels as MSCs cultured in serum-containing medium. Example 4: Media Optimization Media compositions that support the expansion of MSCs were identified. The G2 serum-free medium served as a control for this optimization experiment. Screening plates were prepared using 96-well plates containing 30 factors in 60 different compositions. One thousand six hundred (1600) MSCs were incubated in each well for 7 days. Best media compositions were selected based on the average number of live cells obtained from the repeats from each screen. Best well "hits" of the cytokine screen were the C6, D3, C2, and G5 wells, respectively. The C6 well contained cytokines BDNF, bFGF, BIO, BMP-2, BMP-4, DKK- 1, EGF, EPO, fibronectin, thrombospondin, Flt-3/Flk-2 ligand, G-CSF, IGF-1, IL-11, IL-3, IL-5, IL-6, LIF, PD-ECGF, SCF, SDF-l , and WNT-3a. The D3 well contained cytokines bFGF, BMP-2, EGF, EPO, fibronectin, thrombospondin, Flt-3/Flk-2 ligand, IGF-1, IL-11, IL-5, and WNT-3a The C2 well contained cytokines bFGF, BIO, BMP-2, BMP-4, EGF, EPO, Flt- 3/Flk-2 ligand, IGF-1, IL-11, IL-5, and WNT-3a. The G5 well contained cytokines bFGF, BMP-4, DKK-1, fibronectin, thrombospondin, Flt-3/Flk-2 ligand, IL-6, PD-ECGF, SDF-lα, and WNT-3a. Cytokine compositions of wells C6, D3, C2, and G5 are referred to hereinafter as "C6," "D3," "C2," and "G5," respectively. Media compositions C6, D3, C2, and G5 all outperformed G2 serum free medium controls and 10% serum-containing complete medium (see Figure 5). These serum free media compositions contain 22, 11, 11, and 10 growth factor/cytokine additives, respectively. In addition, serum free media G2 and D3 both performed as well or better than serum-containing complete medium controls and significantly outperform a previously published serum free MSC expansion medium (Lennon et al. (1995) Exp. Cell Res. 219:211-222; United States Patent No. 5,908,782). Three of these serum-free media compositions (D3, C2, and G5) were used to confirm MSCs retained multipotentiality. MSCs were cultured in one of the three serum-free media for 7 days. Expanded MSCs were removed from the serum-free media and then cultured in either adipogenic (fat) or osteogenic (bone) induction media (per manufacturer's suggestions). MSCs remained multipotential and differentiated towards both adipogenic and osteogenic lineages in all three serum-free media, each comparable to the manufacturer's recommended serum-containing complete medium controls (see Figure 6 A and 6B). Further media optimization was performed and the best well "hits" from this cytokine screen were the G7, G4 and C8 wells, respectively. The G7 well contained cytokines bFGF, BMP-2, fibronectin, thrombospondin, Flt-3/Flk-2 ligand, IL-11, LIF, and WNT-3a. The G4 well contained cytokines bFGF, BMP-2, EGF, IL-11, PD-ECGF, and WNT-3a. The C8 well contained cytokines bFGF, BMP-2, EGF, fibronectin, thrombospondin, Flt-3/Flk-2 ligand, IL-11, IL-5, LIF, PD-ECGF, and WNT-3a. Cytokine compositions of wells G7, G4, and C8 are referred to hereinafter as "G7," "G4," and "C8," respectively. Media compositions G7, G4, and C8 all expanded MSCs as well as or better than serum-containing controls (see Figure 7). Additional optimization data was collected employing a variety of media compositions. In one experiment, MSCs were cultured in: 1) the G4 serum- free medium composition; 2) G4 + TGF-/3; 3) bFGF in base medium only; 4) EGF in base medium only; 5) TGF-/3 in base medium only; 6) base medium alone; and 7) serum- containing medium. Although MSCs cultured in G4 expanded as well or better than serum-containing medium, MSCs cultured in G4+TGF-/3 far outperformed any other media composition, nearly triple the serum-containing medium controls (see Figure 8). Furthermore, the single factors, while promoting MSC expansion, did not perform as well as serum in expanding MSCs. However, synergistic combinations of these factors (e.g., G4) expand MSCs more than any single factor, and the addition of TGF- β substantially enhanced expansion. These factor synergies, in combination with the collagen 1 + fibronectin surface, comprise serum- free environments that substantially outperform anything that has been established to date. G4+TGF-/3 serum-free medium was scaled up and used to expand MSCs in 6- well Col 1/FN CAR plates. MSCs were seeded on 6-well plates at 50,000 per well (n=3). Cells in serum containing complete media were seeded onto a 6-well TCPS plate. At confluency, all cells were removed and cell number was determined using Trypan Blue exclusion and hemocytometer counting. Cells were replated at 50,000 per well under the same condition for a second round of expansion. Cell numbers were again determined as above. After the first round of expansion (approximately 6 days), MSCs expanded in serum-free conditions outperformed the manufacturer's recommended serum-containing medium controls. After the second round of expansion (approximately 6 days), the MSCs continued to expand in the serum-free medium at an increased rate as compared to the serum-containing medium controls. G4+TGFb provided 5.4 and 6.5 fold expansion in the first and second rounds, respectively, and regular medium gave 3.5 and 3.1 fold expansion in the first and second rounds, respectively. In another experiment, a serum-free medium comprising base medium and WNT-3a, bFGF, and TGF-/3 was compared to media compositions containing the same components but adding one, two, three, four, five, six, or seven additional cytokines that include EGF, fibronectin, thrombospondin, BMP-2, BMP-4, IL-11, and PD-ECGF in their ability to expand MSCs in culture. Adding one, two, three, four, five, six, or seven growth factors to the serum free medium comprising base medium and WNT-3a, bFGF, and TGF-0 had a positive effect on MSC expansion. In particular, the addition of EGF to the three growth factors already present in the serum-free medium resulted in approximately a 20% increase in MSC expansion over compositions that did not contain EGF, and both BMPs on top of EGF further enhanced expansion. Furthermore, the addition of all seven cytokines to WNT-3a, bFGF, and TGF-/3 gave the best expansion, demonstrating that building complexity into the serum free environments may further enhance MSC expansion. However, the synergies between WNT-3a, bFGF, EGF, and TGF-/3 were found to have the greatest effects on MSC serum-free expansion on collagen 1 + fibronectin surfaces. In another experiment, a serum-free medium comprising base medium was compared to media comprising the base medium plus various combinations of WNT- 3 a, BIO, bFGF, EGF, and TGF-/3 in their ability to expand MSCs in culture (see Figure 9). Specifically, the combinations tested were: base medium alone (no growth factors), Cambrex Biosciences (Baltimore, MD) serum-containing medium on TCPS, base medium + bFGF + TGF-/3, base medium + WNT-3a + bFGF, base medium + bFGF + EGF, base medium + WNT-3a + TGF-ft base medium + WNT-3a + EGF, base medium + EGF + TGF-β, base medium + WNT-3a, base medium + bFGF + EGF + TGF-/?, base medium + WNT-3a + bFGF + EGF + TGF-/3, and base medium + bFGF + EGF + TGF-/3 + BIO. Although all conditions outperformed base medium alone, the growth factor combinations that produced the greatest MSC expansion were base medium + EGF + TGF-/3, base medium + bFGF + TGF-/3, base medium + bFGF + EGF + TGF-/3, base medium + WNT-3a + bFGF + EGF + TGF-/3, and base medium + bFGF + EGF + TGF-/3 + BIO. All publications and patent applications mentioned in the specification are indicative of the level of those skilled in the art to which this invention pertains. All publications and patent applications are herein incorporated by reference to the same extent as if each individual publication or patent application was specifically and individually to be incorporated by reference. Although the foregoing invention has been described in some detail by way of illustration and example for purposes of clarity of understanding, it will be obvious that certain changes and modifications may be practiced within the scope of the appended claims. Flt-3/Flk-2 ligand, IGF-1, IL-11, IL-5, and a WNT signaling agonist; i) a medium comprising bFGF, BMP-4, DKK-1 , fibronectin, thrombospondin, Flt-3/Flk-2 ligand, IL-6, PD-ECGF, SDF-lα, and a WNT signaling agonist; j) a medium comprising bFGF, BMP-2, fibronectin, thrombospondin, Flt-3/Flk-2 ligand, IL- 11 , LIF, and a WNT signaling agonist; k) a medium comprising bFGF, BMP-2, EGF, IL-11, PD-ECGF, and a WNT signaling agonist; and 1) a medium comprising bFGF, BMP-2, EGF, fibronectin, thrombospondin, Flt-3/Flk-2 ligand, IL-11, IL-5, LIF, PD-ECGF, and a WNT signaling agonist. 2. The serum-free cell culture system of claim 1, wherein said WNT signaling agonist is BIO or WNT-3a. 3. The serum-free cell culture system of claim 1, wherein the insoluble substrate protein is an extracellular matrix protein. 4. The serum-free cell culture system of claim 3, wherein the extracellular matrix protein is fibronectin, laminin, HA, vitronectin, collagen I, collagen II, collagen III, collagen IV, collagen V, collagen VI, or any combination thereof. 5. The serum- free cell culture system of claim 4, wherein the extracellular matrix protein is a combination of collagen I and fibronectin. 6. The serum-free cell culture system of claim 5, wherein the WNT signaling agonist is BIO or WNT-3a, and wherein the cell culture surface comprises a cell culture support bound to a cell adhesion resistant material. 7. A method of expanding a population of mesenchymal stem cells using the cell culture system of claim 1. 8. The method of claim 7, wherein said WNT signaling agonist is BIO or WNT-3a, wherein the cell culture surface comprises a cell culture support bound to a cell adhesion resistant material, and wherein the insoluble substrate protein is a combination of collagen I and fibronectin. 9. An expanded population of mesenchymal stem cells that has never been exposed to serum, wherein said population is produced by the method of claim 7. 10. A method of transplanting an expanded population of mesenchymal stem cells, comprising administering the population of claim 9 to a patient in need thereof, wherein the population is administered in an amount effective to reconstitute cardiovascular, bone, or cartilage tissue. 11. A kit comprising the serum-free cell culture system of claim 1. 12. The kit of claim 11, wherein said WNT signaling agonist is BIO or WNT-3a, wherein the cell culture surface comprises a cell culture support bound to a cell adhesion resistant material, and wherein the insoluble substrate protein is a combination of collagen I and fibronectin. 13. A serum-free cell culture system comprising a serum-free cell culture medium and a cell culture surface, wherein said cell culture surface promotes the adhesion and expansion of mesenchymal stem cells and comprises a cell culture support bound to a cell adhesion resistant material, and wherein at least one insoluble substrate protein is presented from the cell culture surface. 14. The serum-free cell culture system of claim 13, wherein the insoluble substrate protein is an extracellular matrix protein. 15. The serum- free cell culture system of claim 14, wherein the extracellular matrix protein is fibronectin, laminin, HA, vitronectin, collagen I, collagen II, collagen III, collagen IV, collagen V, collagen VI, or any combination thereof. 16. The serum- free cell culture system of claim 15, wherein the extracellular matrix protein is a combination of collagen I and fibronectin. Flt-3/Flk-2 ligand, IGF-1, IL-11, IL-5, and a WNT signaling agonist; i) a medium comprising bFGF, BMP-4, DKK-1, fibronectin, thrombospondin, Flt-3/Flk-2 ligand, IL-6, PD-ECGF, SDF-lα, and a WNT signaling agonist; j) a medium comprising bFGF, BMP-2, fibronectin, thrombospondin, Flt-3/Flk-2 ligand, IL-11 , LIF, and a WNT signaling agonist; k) a medium comprising bFGF, BMP-2, EGF, IL- 11 , PD-ECGF, and a WNT signaling agonist; and 1) a medium comprising bFGF, BMP-2, EGF, fibronectin, thrombospondin, Flt-3/Flk-2 ligand, IL-11, IL-5, LIF, PD-ECGF, and a WNT signaling agonist. 18. The serum-free cell culture system of claim 17, wherein said WNT signaling agonist is BIO or WNT-3a. 19. The serum-free cell culture system of claim 17, wherein the insoluble substrate protein is an extracellular matrix protein and wherein the extracellular matrix protein is fibronectin, laminin, HA, vitronectin, collagen I, collagen II, collagen III, collagen IV, collagen V, collagen VI, or any combination thereof. 20. The serum-free cell culture system of claim 19, wherein the extracellular matrix protein is a combination of collagen I and fibronectin. 21. A method of expanding a population of mesenchymal stem cells using the cell culture system of claim 13. 22. The method of claim 21 , wherein the insoluble substrate protein is a combination of collagen I and fibronectin. 23. An expanded population of mesenchymal stem cells, said population produced by the method of claim 21, wherein said cells were unexposed to serum. 24. A method of transplanting an expanded population of mesenchymal stem cells, comprising administering the population of claim 23 to a patient in need thereof, wherein the population is administered in an amount effective to reconstitute cardiovascular, bone, or cartilage tissue. 25. A kit comprising the serum-free cell culture system of claim 13. 26. The kit of claim 25, wherein the insoluble substrate protein is a combination of collagen I and fibronectin. NL2010225C (en) * 2013-02-01 2014-08-04 Conradus Ghosal Gho Composition and method for preserving, transporting and storing living biological materials. NL2010222C (en) * 2013-02-01 2014-08-04 Conradus Ghosal Gho Composition and method for generating a desired cell type and/or tissue type from hair follicular stem cells. NL2011170C (en) * 2013-07-15 2015-01-21 Univ Erasmus Medical Ct Method and culture medium for in vitro culturing of stem cells. ES2102196T3 (en) 1992-11-13 1997-07-16 Univ Washington Peripheralizing pluripotent hematopoietic.